With yesterday's news about the new Nimbuzz for iPhone app and the launch of a Nimbuzz Mac client, I contacted Tobias Kemper, Head of Communications for Nimbuzz and asked him a question about DTMF/touch-tone support in any pending release. Any plans for DTMF support? Noticed when I tested it by calling my Skype for SIP account matched up to my corporate PBX that I couldn't reach my extension since there is no dialpad once the call is initiated. I know touchtones are tricky when sent over an IP connection, which is what RFC 2833 is for. However, RFC 2833 is probably impossible for you guys to support. However, I've found if you simulate the exact frequency tones and send that as a long tone - say 0.5s long, 99% of the time it gets transmitted just fine. Can often get away with ¼ of a second as well. Thoughts? He wrote back, "I will send you the official news in a few mins - WITH more stats and data! DTMF is a great next step for us but I cannot speak to it yet." Ok, so he's not admitting to DMTF support in the future, but he isn't ruling it out either. That's good news, since I really like Nimbuzz. It features SIP capabilities, so I can register it with a SIP-based PBX. Though oddly enough, I had a minor issue with the Nimbuzz for iPhone app with case-sensitivity. I have some test SIP accounts with the format SOFTPHONE01, SOFTPHONE02, etc. all in upper-case. The Asterisk-based trixbox PBX is case-sensitive, so it is expecting the username in uppercase. Well, although I was able to enter in SOFTPHONE01 into Nimbuzz in all upper-case, it wouldn't register. So I SSH'ed into the trixbox server and ran "asterisk - r" to see what was going on. I attempted to register again, and immediately saw the problem in the Asterisk console. Nimbuzz converted my SIP username to all lowercase. Thus, I had to add a new SIP account that was in all lowercase. Looks like they need to update their back-end database to support mixed-case for the SIP username. It's pretty common to use a mix of upper & lowercase letters to help secure the SIP account. In any event, Tobias also told me, "We developed a Mac client (download) in combination with a new iPhone version (download) because we got massive traction since releasing the iPhone client and have a huge number of active users. (official press release below) We did it Apple style, focused on slick UI and usability! " He added, "(Here are) a few stats on why we made the decision to deliver something specific for the Apple fans out there:"
Achieved massive penetration and popularity. For example, 1 in 5 iPhone users in France and in the Netherlands are using Nimbuzz! With the new Nimbuzz Mac you can connect and interact with friends from the most popular instant messaging communities and social networks like, Facebook, AIM, MySpace, Google Talk (Orkut), Yahoo! Messenger, Windows Live Messenger (MSN), ICQ and many more, right from your (i)Mac or MacBook (Pro). 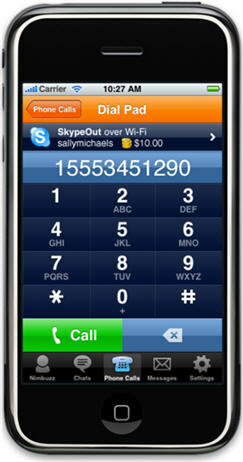 It also lets you call your buddies on Nimbuzz, Windows Live Messenger (MSN), Yahoo Messenger and Google Talk. The iPhone and iPod touch upgrade lets you share photos, music and videos. The beauty of it is that the files are stored online so you have access to your files from your Mac, iPhone or iPod touch! That also saves device memory. Push Notification for iPhone and iPod Touch - with home screen alerts of incoming calls or chats, effectively keeping you available to the rest of the world even though the app itself has been closed. We also introduced another much requested feature: location sharing. Now you can share and retrieve the location of your Nimbuzz buddies on the go. This makes it easier to find your friends and set up face to face meetings. He wrote back, \"I will send you the official news in a few mins - WITH more stats and data! DTMF is a great next step for us but I cannot speak to it yet.\"
Ok, so he's not admitting to DMTF support in the future, but he isn't ruling it out either. That's good news, since I really like Nimbuzz. It features SIP capabilities, so I can register it with a SIP-based PBX. Though oddly enough, I had a minor issue with the Nimbuzz for iPhone app with case-sensitivity. I have some test SIP accounts with the format SOFTPHONE01, SOFTPHONE02, etc. all in upper-case. The Asterisk-based trixbox PBX is case-sensitive, so it is expecting the username in uppercase. Well, although I was able to enter in SOFTPHONE01 into Nimbuzz in all upper-case, it wouldn't register. So I SSH'ed into the trixbox server and ran \"asterisk - r\" to see what was going on. I attempted to register again, and immediately saw the problem in the Asterisk console. Nimbuzz converted my SIP username to all lowercase. Thus, I had to add a new SIP account that was in all lowercase. Looks like they need to update their back-end database to support mixed-case for the SIP username. It's pretty common to use a mix of upper & lowercase letters to help secure the SIP account. In any event, Tobias also told me, \"We developed a Mac client (download) in combination with a new iPhone version (download) because we got massive traction since releasing the iPhone client and have a huge number of active users. (official press release below) We did it Apple style, focused on slick UI and usability! \"
He added, \"(Here are) a few stats on why we made the decision to deliver something specific for the Apple fans out there:\"